Pamper your mother this Mother’s Day with the ultimate relaxation gift of Breakfast in Bed. If she is like most moms, she is up at the crack of dawn, making sure everyone is fed and barely taking the time to sit and eat herself. This is a sweet and very thoughtful gift she is sure to appreciate. Kids of all ages love to help to prepare a delicious Mother’s Day breakfast and serve it to mom. I love to make the presentation beautiful for this special treat. 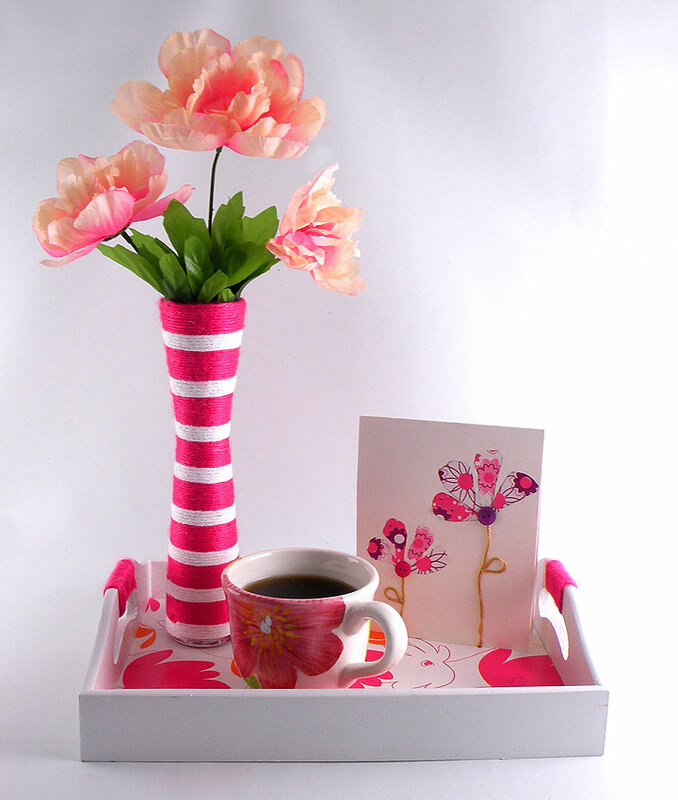 Here are my quick and easy ways to decorate a festive tray and pretty flower vase for her special Mother’s day morning. 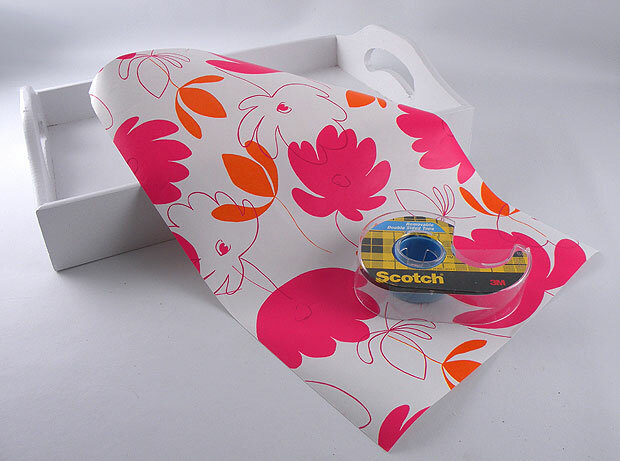 Cut a piece of wrapping paper the size to fit the inside of the tray. 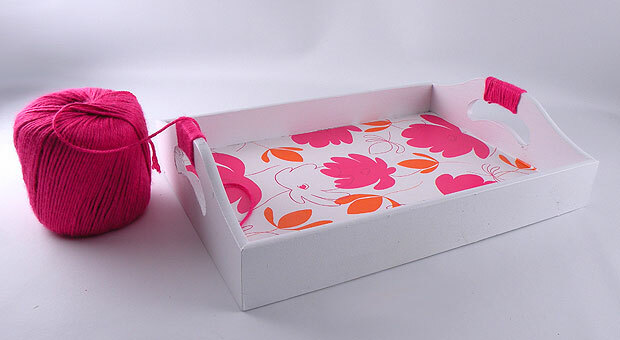 place pieces of double-sided tale to the base of the tray and attach the paper. 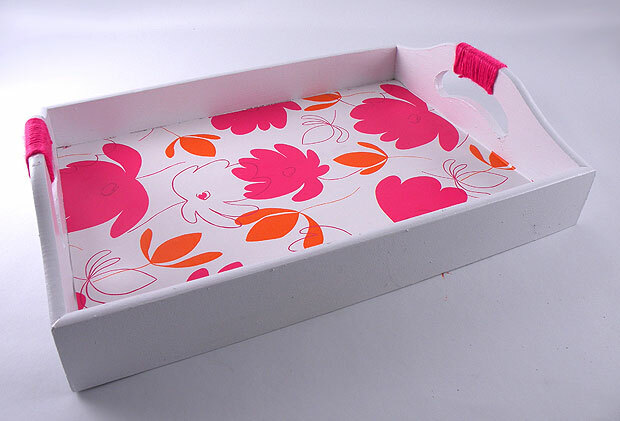 I like to use removable double-sided tape so I can easily replace the paper and change the look of the tray. Wrap yarn around the handles to give then a decorative accent. Secure the ends with craft glue. Secure the end of the yarn at the top of the vase with craft glue. 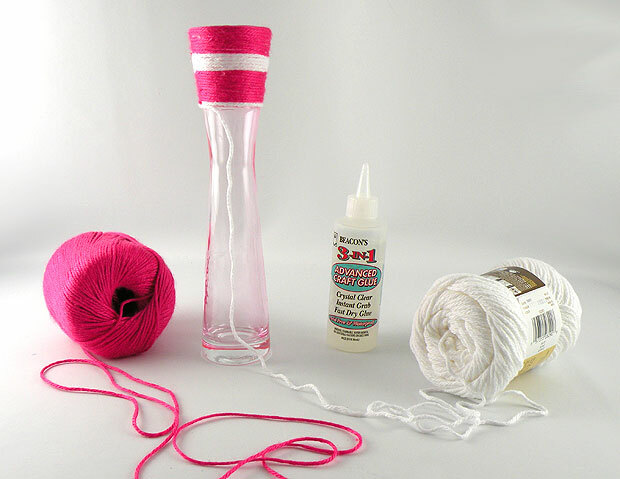 Wrap the yarn around the vase, gluing as you go. Continue to wrap the yarn around the vase, cutting the yarn at the end of each band or stripe and create a new section with an alternating color. Continue until the vase is complete. Fill the vase with flowers, add a handmade card like the one shown here, and your special breakfast to surprise her with this special breakfast in bed.